Littlefield Lands/Duggan House Museum is located on Waylon Jennings Boulevard. 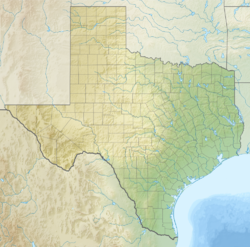 Littlefield is a city in and the county seat of Lamb County, Texas, United States. The population was 6,372 at the 2010 census. It is located in a significant cotton-growing region, northwest of Lubbock on the Llano Estacado just south of the Texas Panhandle. Littlefield has a large denim-manufacturing plant operated by American Cotton Growers. Littlefield houses the Bill W. Clayton Detention Center, a 310-bed, medium-security facility, which is named for the former Speaker of the Texas House of Representatives, who resided in Springlake. Near Littlefield is the Triple Arrow Ranch, known for its historical remnants, owned by Lamb County Commissioner's Court Judge and Mrs. William A. Thompson, Jr.
Littlefield is named for George Washington Littlefield (1842–1920), a Mississippi native, Confederate officer, cattleman, banker, and benefactor of the University of Texas at Austin. In July 1901, Littlefield purchased the southern, or Yellow Houses, division of the XIT Ranch, forming the Yellow House Ranch. At that time, the ranch covered 312,175 acres (126,333 ha) in Lamb, Hockley, Bailey, and Cochran Counties. In 1912, when surveys showed that a new rail line from Coleman, Texas, to Texico, New Mexico, would pass through his property, Littlefield formed the Littlefield Lands Company to sell the northeastern corner of the Yellow House Ranch, a total of 79,040 acres (31,990 ha), to settlers and to establish the town of Littlefield in Lamb County. Littlefield became a stop on the Panhandle and Santa Fe Railway in 1913. Littlefield is located at 33°55′02″N 102°19′30″W﻿ / ﻿33.91722°N 102.32500°W﻿ / 33.91722; -102.32500 (33.9173148, -102.3249022). According to the United States Census Bureau, the city has a total area of 6.3 square miles (16.4 km2), all land. Much like nearby Lubbock, Littlefield has a mild, semiarid climate. On average, Littlefield receives 18 inches (460 mm) of precipitation per year. Summers in Littlefield are hot, with high temperatures in the 90s °F (32 - 37 °C) and dropping into the 60s °F (15 - 20&°C) at nights. The highest recorded temperature was 112 °F (44 °C) in 1994. Winter days in Littlefield are typically sunny and relatively mild in the mid 50s °F (13 °C), but nights are cold with temperatures dipping to the mid 20s °F (-4 °C). The lowest recorded temperature was -6 °F (-21 °C) in 1979. The economy of Littlefield is diverse, but traditionally depends on cotton. American Cotton Growers Denim Textile Plant of Littlefield is the largest employer in Littlefield and Lamb County. Plains Cotton Cooperative Association of Lubbock, a farmer-owned, cotton-marketing cooperative purchased the denim plant from ACG in 1987. American Cotton Growers announced the closure of their Littlefield denim mill  on Friday Nov 07, 2014. The plant closed in 2015, and was purchased by a dairy co-operative, Select Milk Producers. The city is headquarters to Lowe's Market, a grocery store chain in the American Southwest. In August 2008, Littlefield was selected as the new location for a biodiesel plant. Littlefield is the hometown of singer/songwriter Waylon Jennings. Waylon Jennings Boulevard is named in his honor. A celebration of Jennings' 73rd birthday was held on June 18, 2010, to raise funds for the Lands Duggan House Museum in Littlefield. Bull Lake is located about 5 miles (8.0 km) west of town. A municipal campground is located on Highway 385. The world's tallest windmill was said to be below Yellow Houses Bluff at nearby Yellow House Ranch from the early 1900s until 1926, when the 128-foot (39 m)-high structure was blown over. On October 26, 1943, Littlefield was shocked by the murder of physician Roy Hunt and his wife, the former Mae Franks. Hunt, a Lubbock native, graduated from the University of Texas Medical School at Galveston and opened the Littlefield Clinic in 1937. While Dr. Hunt died of a gunshot wound, Mrs. Hunt was bludgeoned to death by a gun. Their bodies, bound together, were found in bed by the couple's five-year-old daughter, who ran screaming to neighbors for help. An estimated 1,500 mourners attended the funerals in the First Methodist Church of Littlefield, which seated only 300. Some 1,200 people stood outside the overflowing church to pay respects. A $15,000 reward was offered, and Governor Coke R. Stevenson took a personal interest in the case. An investigation revealed that Dr. Hunt had also been shot twice in May 1942 by Dr. W.R. Newton, a former medical-school classmate who claimed that Hunt was showing an interest in Newton's wife, Ruth. Another suspect, Jim Clyde Thomas, was gunned down in a personal disagreement on August 22, 1951, in Durant, Oklahoma. The murders, called the "most heinous on the Texas South Plains", remain unsolved. The Hunts are interred at the City of Lubbock Cemetery; their two young daughters were reared by Mrs. Hunt's sister. Clovis Road - The Dr. Roy Hunt Murder - Littlefield, Texas 1942 - 1943 was written in 2009 by a Littlefield native, Dana Middlebrooks Samuelson and Robert Samuelson, M.D. Jerry Scott Hughes wrote the foreword, and the book was based on their research and the files of Judge Harold LaFont. That book was dedicated to Judge LaFont and his son, Bill LaFont. Additional information in the Hunt murder story has come to light since it was originally published in 2009, and resulted in a revised and expanded second edition published in March 2013. The second edition is dedicated to former Texas Supreme Court Justice Ted Z. Robertson. Christena Stephens of the Llano Estacado Heritage Foundation is also writing a book on the Hunt case. At a time when forensic science was hardly known in Texas, Stephens has uncovered clues to solving the case, including tire tracks and black tennis shoes. On February 6, 1973, 7 children were killed and 16 children were hospitalized when a school bus was struck by a moving Santa Fe freight train. The bus was struck on the railroad street intersection on what is now N Eastside Ave. The accident occurred a little after 4:00 pm, with death certificates noting the time of death at 4:05 pm. Police investigation determined that the train was travelling eastbound at 58 mph when it struck the rear half of the northbound bus, causing injuries or death to all 23 children in the bus and injuring the driver, 68 year-old Artis Ray Johnson. Jean Patterson, bus driver of the bus behind Johnson's, as well as three students who were in Johnson's bus, claimed that the bus had stopped at a warning crossing that had functioning lights and bells before moving over the tracks and being struck. Artis Ray Johnson, the bus driver, was cited by Littlefield police the next day for failure to possess a chauffeur's license, which at the time had the penalty of a $200 fine. DPS records indicated that Johnson obtained a commercial driving license on June 8, 1959, after four failed attempts. Despite lacking a proper license, Johnson was hired by Claude Oliver, foreman of Littlefield's school buses. Oliver later explained that he had known Johnson while Johnson worked as a custodian at an elementary school, and that Johnson had driven school buses occasionally when needed. Oliver claimed that he did not check Johnson's record because he knew Johnson was a good driver. The majority of the children were from Fieldton, Texas. The victims were Edward Ortiz,17, his sister Aurora Ortiz, 9, David Frausto, 18, his sister Diana Frausto, 9, Mary Medina, 10, Anita Martinez, 18, and Julie Davis, 9. The accident caused a major impact in the community. Joe Frausto, father of David and Diana Frausto, was driving through town when he came upon the scene of the accident and saw the bodies of his children. Members of the community volunteered to stay with the Frausto, Ortiz, Medina, Martinez, and Davis families, ensuring that the families would not be left alone. Teachers reported leading their students in prayer and some discussion, but for the most part contemporary reports reflected a quiet response from elementary school students, even as the wrecked bus was temporarily moved into a field within sight of the school. The bus route was continued within days, with Claude Oliver serving as bus driver. Two memorial services were held on February 8, 1973, for the students. The first was held at the Littlefield Junior High School auditorium in the morning before classes started, and was for Junior and High School students. The second service was held in the same auditorium later in the day for kindergarten through sixth grade students. The police probe into the accident did not lead to any criminal charges. A suit was filed on March 3, 1973 by the Ortiz family against the Santa Fe railroad company and Artis Ray Johnson for the deaths of Edward and Aurora Ortiz and for the injuries of Betty Ortiz. The Foley family also filed a suit for the injuries received by their son, Terry. An earlier suit was also filed by three families of victims. The Atchison, Topeka, and Santa Fe Railroad Co. filed a 3rd party suit against Johnson for lacking the qualification to drive the bus and against Littlefield ISD for negligence in hiring Johnson. As of the 2000 United States Census, 6,507 people, 2,390 households, and 1,699 families resided in the city. The population density was 1,085.4 people per square mile (419.4/km²). The 2,784 housing units averaged 464.4 per square mile (179.5/km²). The racial makeup of the city was 77.10% White, 5.38% African American, 0.69% Native American, 0.17% Asian, 0.05% Pacific Islander, 14.62% from other races, and 2.00% from two or more races. Hispanics or Latinos of any race were 45.83% of the population. Of the 2,390 households, 34.2% had children under the age of 18 living with them, 54.0% were married couples living together, 11.7% had a female householder with no husband present, and 28.9% were not families; 27.0% of all households were made up of individuals and 14.2% had someone living alone who was 65 years of age or older. The average household size was 2.64 and the average family size was 3.22. In the city, the population hwas distributed as 29.3% under the age of 18, 8.9% from 18 to 24, 24.1% from 25 to 44, 19.9% from 45 to 64, and 17.8% who were 65 years of age or older. The median age was 36 years. For every 100 females, there were 93.9 males. For every 100 females age 18 and over, there were 89.3 males. The median income for a household in the city was $26,271, and for a family was $29,842. Males had a median income of $25,978 versus $20,160 for females. The per capita income for the city was $15,018. About 18.8% of families and 20.8% of the population were below the poverty line, including 26.5% of those under age 18 and 15.6% of those age 65 or over. Littlefield is served by Lubbock International Airport and Littlefield Municipal Airport, a general-aviation airport which can accommodate small jets, located roughly 2 miles (3 km) outside of the Littlefield city limits. Littlefield sits at the crossroad of US Hwy 84 which runs from Midway, Georgia, to Pagosa Springs, Colorado, and US Highway 385, which runs from Deadwood, South Dakota, to Big Bend National Park in Texas. Both highways are corridors for tourists and main shipping routes used by trucks. The City of Littlefield is served by the Littlefield Independent School District and by a branch of South Plains College. The most westerly piece of debris (a thermal protection system tile) from the 2003 Space Shuttle Columbia disaster was found in a field here. Gene Mayfield (1928–2009), a high school and college football coach, began his career in Littlefield. Lisa Whelchel (born 1963), was a Mouseketeer on New Mickey Mouse Club, an actress on The Facts of Life, and a contestant on Survivor: Philippines. According to the Köppen climate classification system, Littlefield has a semiarid climate, BSk on climate maps. ^ a b c "Littlefield". Geographic Names Information System. United States Geological Survey. ^ "Profile of General Population and Housing Characteristics: 2010 Demographic Profile Data (DP-1): Littlefield city, Texas". U.S. Census Bureau, American Factfinder. Retrieved January 26, 2012. ^ "Our Denim Plains Cotton Cooperative Association". Retrieved November 21, 2012. ^ Gracy II, David B. "Littlefield, George Washington". Handbook of Texas Online. Retrieved April 27, 2013. ^ Duke, Cordia S.; Joe B. Frantz (1961). 6000 Miles of Fence, Life on the XIT Ranch of Texas. Austin: University of Texas Press. pp. 6–7. ISBN 0-292-77564-4. ^ a b Gracy II, David B. "Yellow House Ranch". Handbook of Texas Online. Retrieved April 27, 2013. ^ a b Hunt, William R. "Littlefield, TX". Handbook of Texas Online. Retrieved April 27, 2013. ^ "Geographic Identifiers: 2010 Demographic Profile Data (G001): Littlefield city, Texas". U.S. Census Bureau, American Factfinder. Retrieved January 26, 2012. ^ a b c "Monthly Averages for Littlefield, TX". The Weather Channel. ^ "American Cotton Growers (ACG) page". American Cotton Grower's. ^ "Littlefield denim mill to close Jan. 6 article". WSMV News. ^ MUSICO, JOSIE. "Dairy company purchases former Littlefield denim mill". lubbockonline.com. Retrieved 10 April 2018. ^ "Lowe's Market about page". Lowe's Market. ^ Jennings, Waylon; Lenny Kaye (September 1996). Waylon Jennings: An Autobiography. Grand Central Publishing. ISBN 978-0-446-51865-9. ^ "Barn dance to support Littlefield house museum and celebrate Waylon's birthday". Lubbock Avalanche-Journal, June 11, 2010. Retrieved June 11, 2010. ^ a b Christena Stephens of Sundown, Texas, "The Hunt Murders in Littlefield, Texas, 1943", Annual meeting, West Texas Historical Association, Lubbock, Texas, April 3, 2009; The paper was published under the title "Double Murder in a Small West Texas Town" in the West Texas Historical Association Year Book. ^ Pollack, Jack Harrison (September 1973). "Grade Crossings take a deadly toll". Popular Mechanics: 141. ^ a b "Bus-Train Crash Kills 7: Wreck Rips West Texas School Vehicle". The Dallas Morning News. February 7, 1973. ^ Death Certificate, Texas Department of Health, Bureau of Vital Statistics. Aurora Ortiz, 13458. February 6, 1973. Rec'd March 23, 1973. ^ a b c "Police Finish Probe into School Bus Crash". The Dallas Morning News. February 16, 1973. ^ "7 CHILDREN KILLED IN BUS HIT BY TRAIN". The New York Times. February 7, 1973. ^ a b "Bus Driver Didn't Have Correct License". The Dallas Morning News. February 8, 1973. ^ a b Schwartz, Maryln (February 8, 1973). "Littlefield Binds Wounds: Shocked Town Comforts Bus Wreck Victims' Families". The Dallas Morning News. ^ "Now Toughest Job is Driving the Bus". The Dallas Morning News. February 8, 1973. ^ "Littlefield Holds Two Services". The Dallas Morning News. February 9, 1973. ^ "Suit Filed in Bus-Train Tragedy". The Dallas Morning News. March 4, 1973. ^ "Railroad Files 3rd-Party Suit". The Dallas Morning News. April 22, 1973. ^ "Littlefield, Texas Köppen Climate Classification (Weatherbase)". Weatherbase. Retrieved 10 April 2018. Wikimedia Commons has media related to Littlefield, Texas. This page was last edited on 7 April 2019, at 11:23 (UTC).